Whether you are a teacher looking for creative ways to celebrate Halloween with your students or are a room mother who has been placed in charge of planning a party for this special day, there are plenty of fun ways to mark the occasion. Use fresh ideas that will help you turn your next Halloween party into a fun and exciting event, which the lucky children who get to attend will love! The following school Halloween party ideas will help you plan, organize, and create a wonderful fall celebration. Station One: Let kids decorate small pumpkins. Have paints, brushes, and other embellishments, like glitter, sequins, buttons, and glue on hand as well. Station Two: Kids can make a variety of crafts at this station, such as cut-out ghosts, scarecrows, etc. Station Three: At this station, let kids color Halloween-themed pictures. Then, hang those pictures around the room. Station Four: The fourth station could be a "creepy stuff" table with peeled grapes for eyeballs and cooked noodles for brains. To make it even more fun, blindfold the kids and let them try to guess what they are touching. At the end of the party, provide some yummy treats for kids to enjoy. Give each child a few of each of the items along with a glue stick or bottled glue. Once kids have decorated their bags, fill them with a variety of treats, like small candy bars, pretzels, and gummy worms, as well as small toys and objects like Halloween-themed pencils, erasers and stickers. This is a fun game to get kids up and moving around the room. Set up as you would for any musical chairs game, placing chairs in the circle with one less chair than there are children. Play Halloween-themed music, like "Monster Mash." When the music stops, the child left without a chair is eliminated. For this activity you'll also need several volunteers. You may want to set up a face painting station along with other stations in the room and let one or two volunteers paint designs on children's faces. Designs could include pumpkins, scarecrows, ghosts, witches, black cats and other Halloween images. Be sure to take pictures of the kids and give their parents copies if possible. Create simple masks out of paper or foam plates. Let kids color the masks to look like jack o'lanterns, black cats, ghosts, and goblins. Cut out other plates, construction paper, foam, or felt for ears. Staple or glue pipe cleaners or pieces of yarn for hair. Cut a hole on either side of the plate, pull a strand of elastic through the holes, and staple or glue. Let kids parade around the room wearing the mask. If you are a classroom teacher or a parent volunteer, it's important to be aware of the school's policy on Halloween parties. The party you host should conform to school guidelines in terms of overall theme, food options, games and activities. 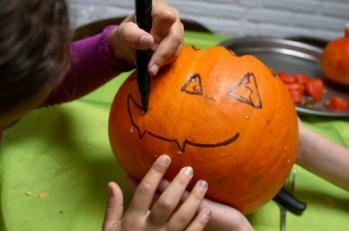 In some school districts, Halloween parties are no longer held due to conflicts with religious beliefs. In others, schools have chosen to change the name of the event to a "fall celebration" and eliminate the word "Halloween" altogether. Still, Halloween continues to be a favorite time in the lives of many children and adults, and schools often set aside a time for kids to participate in party activities. Spooky but not scary Halloween party ideas are appropriate in schools where such parties are allowed. Have fun adapting these ideas for your children!